Have I mentioned how much I love mushrooms? Well I LOVE them. 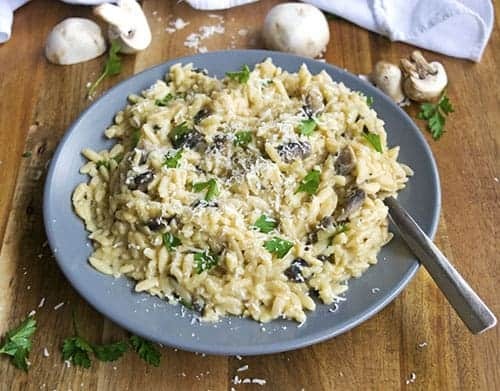 This 30 Minute Mushroom Risotto is perfect. It has mushrooms, pasta, and cheese (all my favortie things!). This dish makes a great dinner, or a quick side dish. 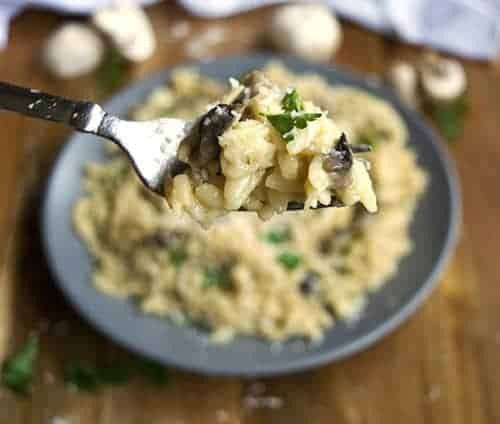 Did I mention how much I love creamy risotto… It is so luxurious and usually takes a long time to make. Cut the time down by using orzo pasta which cooks fast. I like fast recipes if you haven’t noticed! I just finished my shift tonight, and it was a great one. Sometimes as a server you have nights were everyone is in a good mood (the servers and the guests, what?!). Everything ran perfectly and ended perfectly. Yum… the best part about tonight was there were no late night surprise guests. I know it’s my job to serve until the restaurant is closed, but it really is a bummer to get that one table 10 minutes before close. 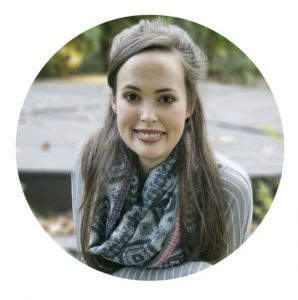 It means your are going to be stuck for an extra hour at work with just that one tip for compensation (in Tennessee server’s wage is $2.13/hour which all goes to taxes anyway). I am not one to complain though. It’s just part of the job. This risotto makes it all better. Nom, nom, nom. Haha! This recipe is the perfect side for the Skillet Chicken with Bacon Mustard Sauce. Throw in some Roasted Vegetables for a well balanced meal! 30 Minute Mushroom Orzo Risotto is a creamy dinner recipe or side dish recipe. 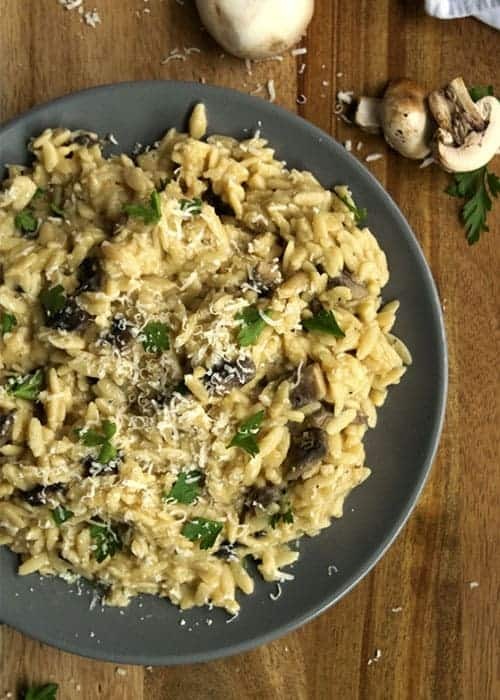 The meaty mushroom are a perfect compliment to this velvety pasta. 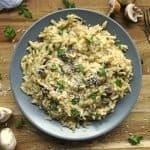 I am in love with this quick and easy risotto. In a medium sauce pan, heat up the 2 Tablespoons of olive oil over medium high. Add the onions and mushroom, and stir for 2 minutes. Sprinkle in the salt, pepper, garlic, and orzo into the pot. Stir constantly for 2 minutes to toast the pasta. Pour 2 cups of broth into the pot and continue to stir making sure nothing sticks to the bottom. After the liquid has been absorbed add 2 more cups (it took around 2 minutes for mine). Keep stirring occasionally until the liquid has absorbed (around 10 minutes). Add the last 2 cups of broth and keep stirring occasionally until the liquid has been absorbed by the pasta (another 10 minutes or so). Mix in the Parmesan cheese and lemon zest to the risotto. Taste for more salt and pepper. Garnish with parsley.